Engaging interactive activities that ensure your students are fully prepared upon arrival for their lab practical, enabling the most effective use of laboratory time and resources. 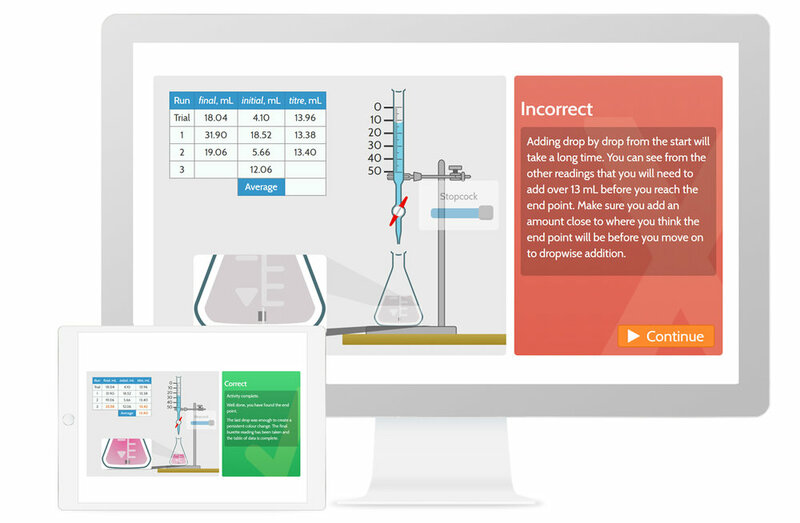 Advanced assessments created for your experiments that provide consistent, personalised, immediate feedback and are fully configured to match your grading requirements. Our pre lab library has over 100 interactive resources with dozens more in the pipeline! Integrate resources from our extensive content library and customise them to match your experiments. Further enhance with bespoke resources to address any additional learning requirements. Interactive and engaging resources with immediate and personalised feedback. Designed to be accessible anytime, across multiple platforms and devices, and to support different students’ learning styles. A fast, simple process to integrate with your VLE, seamlessly blending into your course and connecting with your gradebook to give your students a professional, intuitive user experience. Students benefit greatly from hands-on practical experience. Digital resources offer transformational solutions that will enhance and improve the experience for both staff and students.